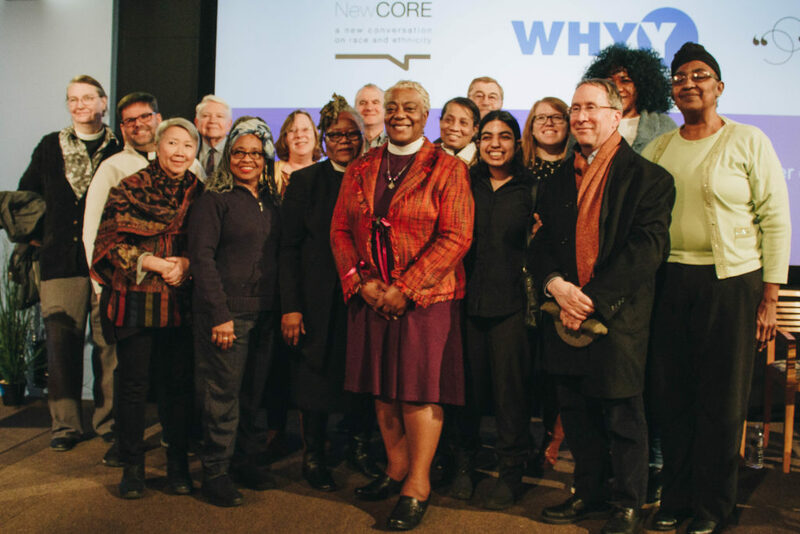 Bishop Patricia A. Davenport was one of five conversationalists who participated in Interfaith Philadelphia’s “Conversation on Race and Faith” at WHYY January 17. The bishop joined the Rev. Steven Lawrence, president of NewCORE (A New Conversation on Race and Ethnicity), Rabbi David Strauss of Main Line Reform Temple, Sheikh Anwar Muhaimin of Masjid Quba, and the Rev. Bonnie Camarda, director of partnerships for the Salvation Army, in modeling listening to people with different experiences and having civil conversation about difficult issues. Reverend Lawrence, Bishop Davenport, Rabbi Strauss, and Pastor Camarda listen to Sheikh Muhaimin (second from right). 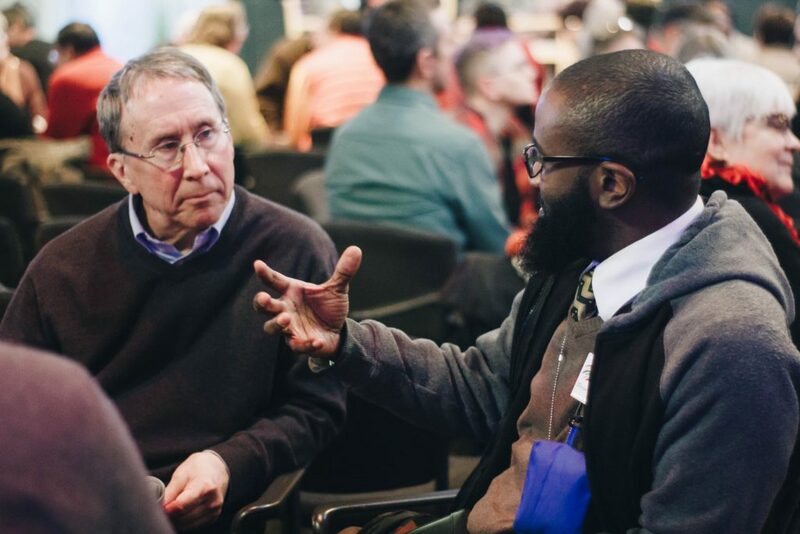 The conversation started out with each person describing how race and faith intersect in their lives. “I am a black guy who speaks Arabic very well,” Sheikh Muhaimin said. He was a sixth grader at Masterman School in Philadephia when the family moved to Saudi Arabia, where he learned that “kids in every culture are mean.” Demoted to first grade because he could not speak the language, Muhaimin went on to memorize the Quran by age 15. A number of Lutheran leaders attended the conversation. “I am living proof of my predecessors’ prayers,” he said, noting that Jim Crow-era African American Muslims desired a religious leader who understood them. “The demarcation of ‘Black’ is limiting,” he said. “Black people are not a monolith. There are all types of ways to be black” in daily and religious life, he said. She answered: “I am white because my skin is white, but that is not who I am.” As a native of Cuba, she is distinct within the breadth of Hispanic culture. We share the same language, but we are not all the same, she said, even down to cuisine. She recalls serving her native rice and beans to visiting pastors from Argentina, who preferred pasta due to the Italian influence in their home country. 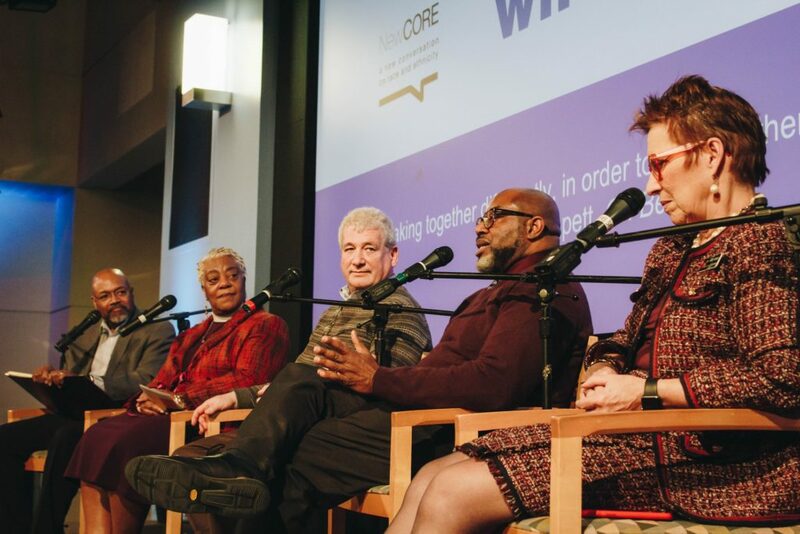 After listening in on the conversation among the religious leaders, the audience of about 200 broke into small groups to listen to each others’ stories. 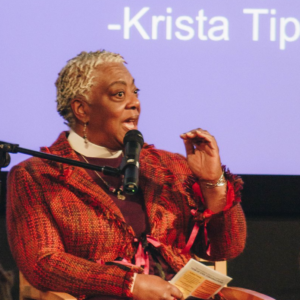 The event was the first in a year-long series of activities in Interfaith Philadelphia’s Year of Civil Conversations, in conjunction with journalist Krista Tippett, host of public radio’s “On Being.” Several other conversations and training sessions for civil conversation facilitators round out the season, culminating in a live recording with Tippett and local Christian activist Shane Claiborne in April. Story by Bob Fisher. Photos courtesy Interfaith Philadelphia. Pastor Stephen Keiser of Christ, Upper Darby, engaged in conversation.